In LYF Jio F90M The No SIM card error usually occurs when your SIM card is not inserted properly. This is the most common reason for the error but it is not the only reason why your phone may show this error. No SIM card can mean problems with your device’s software too. There is a chance that the SIM card is inserted properly but your device is not reading it because of a software corruption. It may also point towards your device’s inability to check for a network. How to repair the damage to the sim card in the LYF Jio F90M we will discuss the insert sim card, sim card is not valid, broken sim card and tricks jumper. Such damage should not we take it to the phone repairman. but with the notes, you have equipment like tester tools, solder and tin, screwdriver, and refined to make a jumper cable. SIM is inserted but still, there is a message saying “Insert SIM”. The Mobile Phone goes OFFLINE when the SIM Card is inserted. SIM works for sometime and then it stops working. There is a message that says “Invalid SIM”. 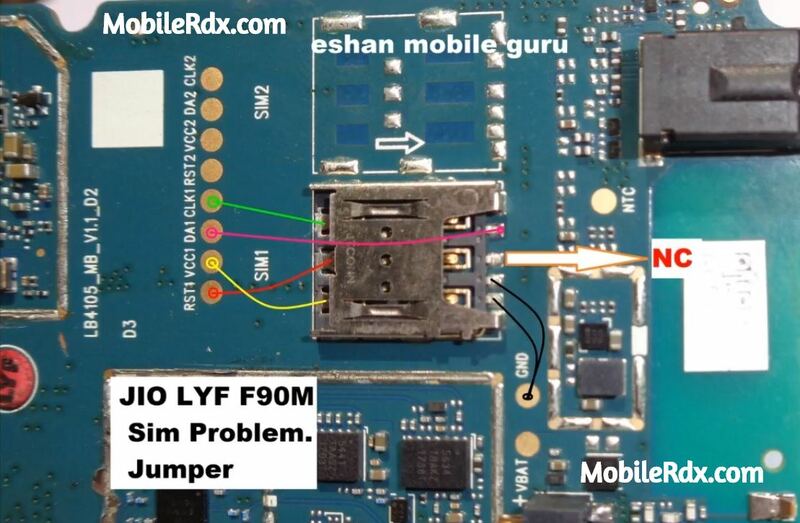 Here Are the LYF Jio F90M sim card ways and its jumper solution check the sim card using a multimeter if any tack found damage make the jumper as shown in the below diagram. Check all track ways from sim card connector with the help of a multimeter, if any of them is faulty make a jumper.